The IA4SI methodological framework is based on a quali-quantitative multi-stakeholders approach, which engages projects coordinators, their partners, project users and European citizens. It builds on previous research in the field and takes advantage of well-tested methodological frameworks adapted to the peculiarities of the Digital Social Innovation sector and, particularly to CAPS (Arniani and others, 2013). 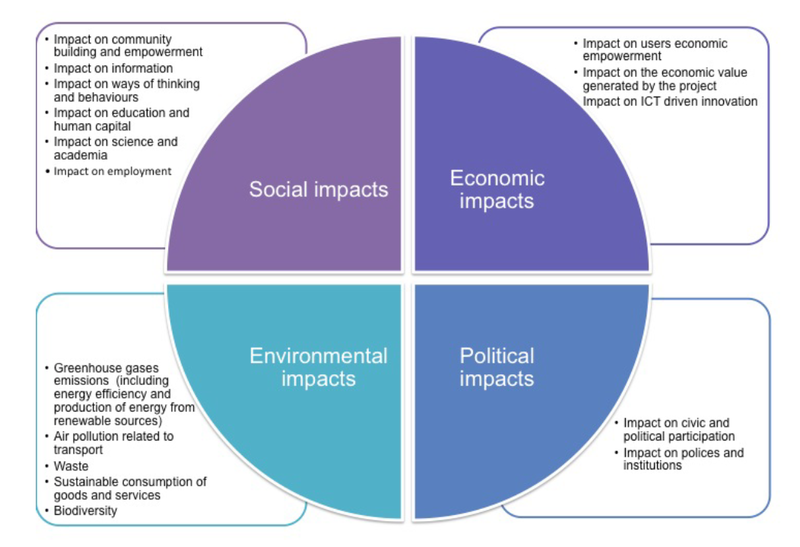 The assessment uses eight synthetic indices: 4 of them are related to specific areas of impact and related sub categories and are illustrated in the figure below. The vertical indices are: Social impact, Economic impact, Environmental impact and Political impact. Each vertical index is built up from sub-indices each corresponding to a specific category. 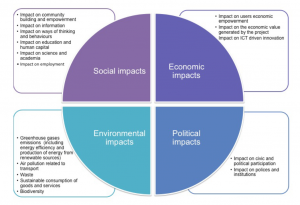 For example the synthetic index Social impact is composed of 6 indices, one for each subcategory such as Impact on “Community building and empowerment”, “Impact on information”, “Impact on way of thinking and behaviours”, etc. Besides the four vertical indices, the IA4SI methodology incudes 4 transversal indices that provide information about the process followed by the CAPS projects in determining their impacts. In other words, the transversal indices are related to the attributes of the innovation developed. The four indices are: efficiency, effectiveness, sustainability and fairness. These four indices are inspired by Philip, Deiglmeier and Miller, that describe social innovation as a solution which is meant to be: “more effective, efficient, sustainable, or just than existing solutions” (2008:36). The IA4SI methodology is based on Cost-Benefit Analysis, on Multicriteria Analysis and on the Social Media ROI. To analyse any changes in CAPS users’ attitudes and behaviours a Stated Preference methods and Revealed Preference methods will be used while for the environmental impact assessment the Ecological Footprint methodology and Global Reporting initiatives approach is used.